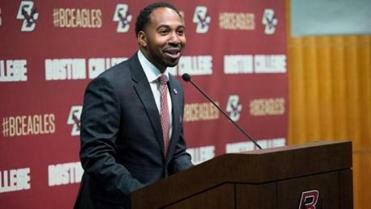 Before he dived into the challenges facing a Boston College athletic program trying to revive itself in a competitive Atlantic Coast Conference landscape, Martin Jarmond took a step back to look at the opportunity. BC began the search for a new athletic director in February after Brad Bates announced that he would step down at the end of the school year to pursue a career in consulting. One of the candidates who stood out was Jarmond, who at just 37 had risen through the ranks over seven years at Ohio State to deputy director of athletics. He led several major fund-raising campaigns and served as the lead administrator for several sports, including the program centerpiece, football. Jarmond was contacted by the Parker Search Firm in March, and while he wasn’t actively looking to leave Ohio State, he was open to having a dialogue. “It was something that was kind of evolving and developing,” Jarmond said. “It was not something that was last minute. “I was always involved, but there was a mutual getting-to-know-each-other that was going on, and I needed to learn more. I had a great job at Ohio State and was very happy, so I wasn’t really looking to leave. With his wife Jessica, their 20-month-old daughter Scarlett, his parents, and some close friends on hand, Jarmond was introduced Tuesday as BC’s new athletic director. He laid out his vision for re-instilling a winning culture while acknowledging the inevitable learning curve he’ll face. “Winning requires vision, preparation, focus, and commitment,” Jarmond said. “Our vision is for consistent, competitive excellence in all that we do. Jarmond spent the day meeting with media, student-athletes, and administrators, getting a feel for his new surroundings. From his career as a walk-on-turned-team captain at UNC Wilmington to the years he spent cutting his teeth in Michigan State’s athletic department to his formative years at Ohio State, Jarmond considers his ability to connect with people one of his greatest skills. “It all starts with people, and that’s the same no matter where you are,” he said. “So first and foremost, I have to get here, and I want to learn and understand what we do and who I work with — our coaches, our staff. What immediately jumped out to Jarmond was the $200 million commitment BC made to a facilities project in 2016. The plan included a 240,000-square-foot recreational center, a field house, and new baseball, softball, and intramural fields. “What’s exciting is $200 million,” Jarmond said. “That’s very exciting. I have not looked at the plans specifically. That’s one of the first things that I’m going to try to get sent to me so I can kind of learn what’s going on. Jarmond said he would remain at Ohio State through June to finish out his duties there along with commitments for national committees before officially starting at BC, but he’ll be diving into his responsibilities at BC at the same time. One of the biggest immediate challenges, he said, will be making the transition with his family from Columbus to Boston and getting up to speed with the coaches and staff in his charge. While he’ll have immediate issues to address, he said the first step would be gathering as much information as possible. “The biggest challenge is really learning the team that I’m working with, the coaches, understanding what our challenges are from the coaches,” he said. “And we have a lot of coaches, and I’m still not here yet.